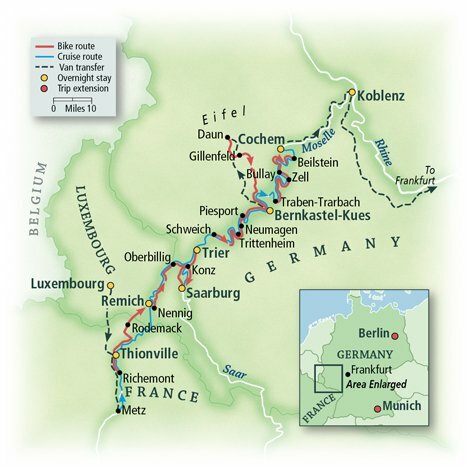 Cruise and pedal through Germany, Luxembourg and France on this beloved floating adventure. Your deluxe barge moors beneath hilltop castles and alongside half-timbered villages brimming with blossoms and cozy taverns. The gentle Mosel River snakes through dramatic slate mountains and sloping vineyards glistening in golden droplets of Riesling. Bike along Roman routes on easy paths, through ancient Teutonic forests where legends of buried treasure, dragons and red-headed giants lurk in the mists. 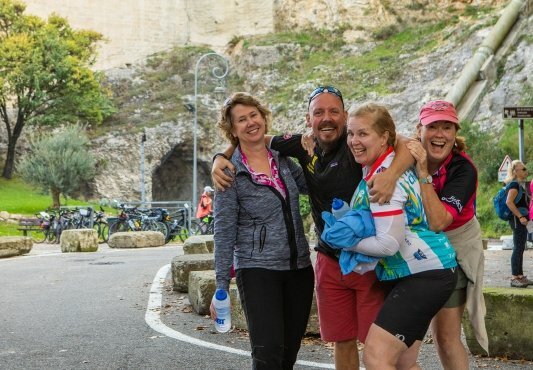 Picnic in Lorraine’s rich countryside, taste rare Luxembourg wines, ride around volcanic lakes, over valley viaducts and bikes-only train tunnels. We’ve got one word for this tour: Exciting! 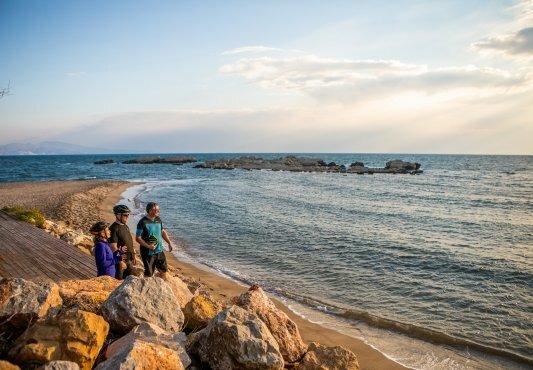 This tour offers easy terrain on bike paths and roads through both urban and rural areas. Our VBT support shuttle is available every day at designated points for those who would like assistance. Depart from home for Luxembourg City, Luxembourg. The particulars of your arrival overseas are detailed with your flight itinerary. Upon arrival at the Luxembourg City airport, claim your luggage and clear customs. If your luggage is lost, fill out a PIR form before leaving the customs area – VBT representatives are not allowed into the customs area. Please note: Make certain that your VBT luggage tags are affixed to your bag so your VBT representative can identify you. After exiting customs, enter the arrival hall and look for your VBT representative, who will be holding a VBT sign. You will transfer via taxi or minibus (approximately 20 minutes) to your hotel in Luxembourg City. If you arrive early, your hotel room may not be available until 3:00 p.m. You may store your luggage at the front desk. The rest of the day is free for you to discover this fascinating city, the capital of one of Europe’s smallest countries. Explore cobblestone-arched narrow streets and small elegant palaces such as the Palais Grand-Ducal and the Chambre des Deputes. The beautiful Chemin de la Corniche is said to be Europe’s most beautiful terrace, with a pleasant promenade that passes restored ancient homes. You’ll also bask in the beauty of the city’s two major squares: the regal Place de la Constitution and the cozy Place du Marche, still used for weekly flower and vegetable markets. Tonight, dine on your own. The city boasts more Michelin stars per square mile than any other and has a lively atmosphere in its many cafés, pubs and pizzerias. The biggest ethnic community here is from Portugal, which adds a Latin flair to the city’s menus. 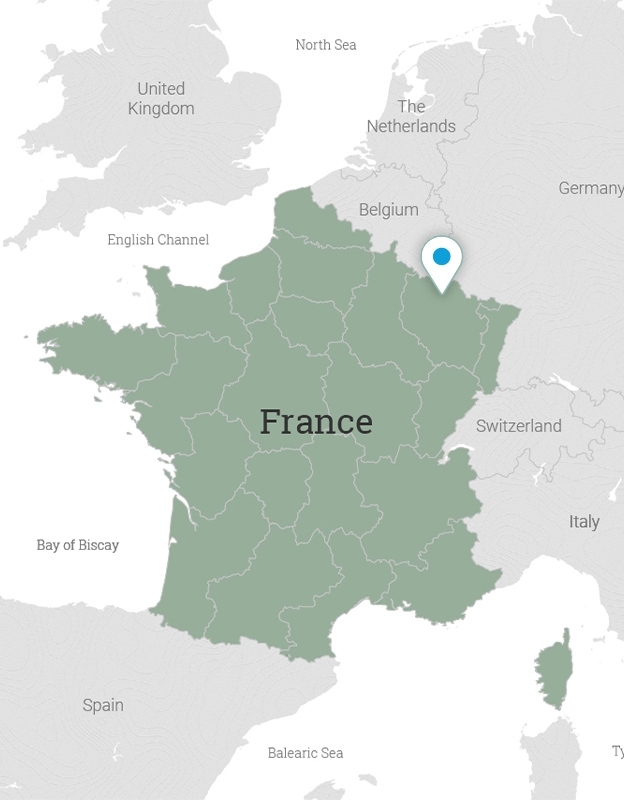 VBT Air Package and Pre-Trip Extension guests: Please be ready and waiting in the hotel lobby at 9:00 a.m. for our transfer by coach (approximately 1 hour) to the French city of Metz, nestled at the confluence of the Moselle and Seille rivers. There will be a short 15-minute stop at the Luxembourg American Cemetery en route so you can honor those who fell here during World War II. Upon arrival in Metz, meet your local city guide and take a pleasant walk into the charming city center, a quaint tapestry of bridges and romantic corners. Pass the elegant 18th-century city theater and the Palais de la Prefecture in the Place de la Comedie. Admire the imposing Cathedral of St. Etienne, one of the most beautiful Gothic cathedrals of France, built around 1250. Admire the fine stained-glass windows, including a modern one by Marc Chagall. Then, walk to the Saturday morning local market and to the lively Place St. Louis and Place Saint-Jacques, where there’ll be time to shop or explore. After lunch on your own, rejoin your local city guide and walk to your barge’s mooring point. At 2:00 p.m., we board your barge. After meeting the crew and your VBT Trip Leaders, settle in before participating in a bike safety session whilst cruising to Richemont. Here, you will disembark for a bike-fitting and a short warm-up ride. Later, return to the barge at its new mooring point and have time to change before gathering for a welcome drink and dinner on board. Tonight, the barge moors in the quiet countryside, just outside Thionville city. Please note regarding Wi-Fi onboard the barge: Due to the nature of the barge movements, internet access is not always available. Therefore, if stable internet access is critical to you, VBT recommends that you purchase your own bundle before traveling overseas. Please note regarding Ride with GPS: Due to the limited Wi-Fi onboard, VBT also recommend that you download your VBT Maps & Routes Notes from a WI-FI zone prior to arriving on the boat if you wish to use Ride with GPS on your smartphone. During your vacation, you will be able to follow these route notes on your smartphone with turn-by-turn voice navigation as you ride. 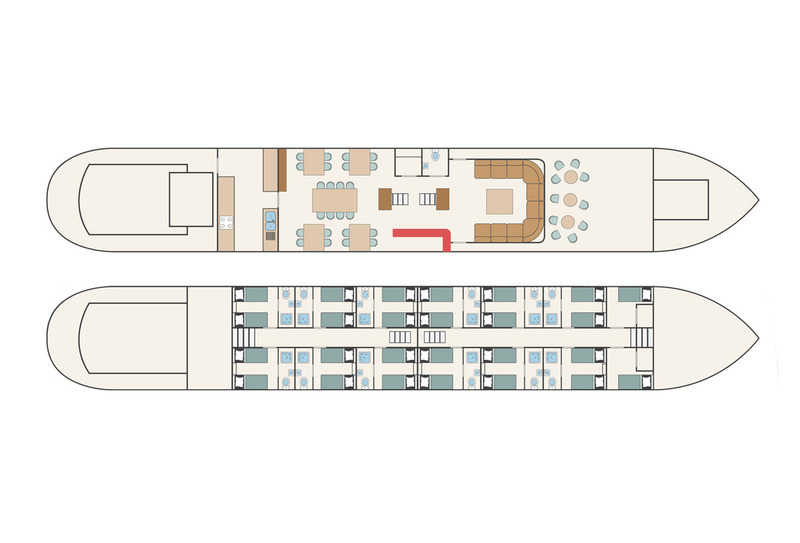 This option is in addition to VBT’s traditional printed maps and route notes available on tour. After breakfast on board, cycle along the Moselle River on a quiet bike path. 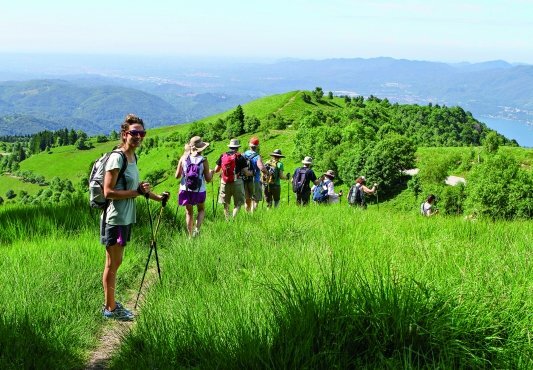 Then turn inland and cycle along a pleasant rolling route through small villages to Rodemack, known as Little Carcassonne Lorraine and ranked one of the most beautiful villages in France. 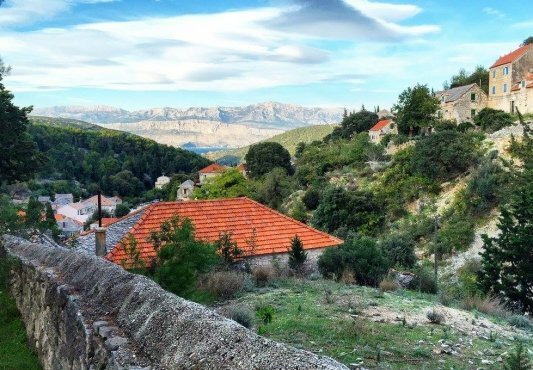 Here in this charming village, you’ll admire marvels of construction that span the ages, including fortifications erected over many centuries. 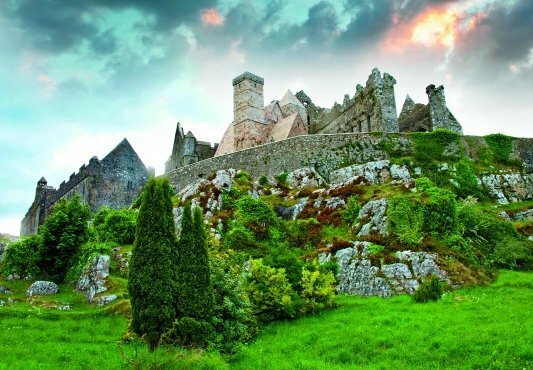 Impressive ramparts and walls encircle the village, and there’s a labyrinth of back streets and cobbled alleys to explore, as well as an impressive fortress. After a picnic lunch at the fountain, you have free time to explore on your own. You may ride or cruise this afternoon. Dinner tonight is on the barge. Afterward, the captain speaks about navigation and our planned route. The barge moors in Remich, Luxembourg. Pedal this morning to Nennig and its local museum, where you can admire Europe’s largest Roman mosaic; remarkably, 90% of it is original and perfectly restored. Continue riding along the Mosel on an easy bike path. The river forms a natural border between Germany and Luxembourg. Our route, on the German side, has the best views of vineyards sloping down hillsides. This is the Route du Vin, or wine road, famous here for its outstanding Riesling and Cremant wines. Stop for lunch onboard the barge in Nittel for a cruising lunch to Wasserbillig, Luxembourg. You may cruise or continue cycling from this point. If you choose our longer option, you will ride past Konz, a small city at the confluence of the Mosel and Saar rivers, then continue into the Saarland along the more intimate Saar River. Wooded mountains, wide meadows and farmsteads and villages mark your progress as you ride. Later this afternoon, arrive in Saarburg, a medieval riverside jewel at the foot of a castle. The town center boasts a roaring 65-foot-high waterfall. Spend the rest of the day exploring this lovely town or continue cycling a loop south of Saarburg along the Saar River. The barge moors in Saarburg this evening with dinner included onboard. This morning, walk to the nearby former bell foundry and museum, Mabilon, which produced bells until 2002. After your tour, start pedaling again along the Saar River to the confluence of the Mosel River to meet the barge in Trier for lunch. After lunch you are free to explore this wonderful town. The people of Trier might tell you that it is possible to see “2,000 years of history in 2,000 paces” in their city. The Romans established their local capital here. In the Middle Ages, Frankish kings and the archbishops of Trier reigned. Here you can learn about the Porta Nigra (“Black Gate”), the city’s landmark and the largest city gate of the ancient world; the amphitheater; the medieval Market Square, Germany’s oldest Cathedral next to the Church of Our Lady, and Constantine’s Throne Hall; the rococo Electoral Palace; the ruins of the Imperial Baths and its extensive subterranean passages. It is an astounding repository of history and leaves little doubt why the whole of Trier’s monuments have been designated a UNESCO World Heritage Site. Tonight, your barge moors here; find dinner in one of the local restaurants. This morning you will cruise out of Trier during breakfast. Arriving in Schweich, you have the option to continue cruising to Neumagen or start your day cycling towards Bernkastel-Kues. Your route winds along scenic hairpin turns along the Mosel, passing the wine-making villages of Trittenheim and Piesport. See a reconstructed Roman winepress in Piesport, along with other examples of a rich Roman past. Stop for lunch on your own in Neumagen, where there are more signs of ancient Rome. From here, shuttle to Bernkastel-Kues, or continue biking among vineyards and orchards, watching for swans and other birds. Meet the barge in Bernkastel-Kues, then rest or explore before dinner on board. Bernkastel and Kues, united in 1905, were once two small cities divided by the Mosel. The pride of today’s dual city is the market square, with its picturesque timber-framed houses and decorative sculpted fountains, some dating to the 17th century. After dinner, stroll to the fascinating cellar of Josef Zimmermann via an elegant district of fine Jugendstill villas, many of which display WEINGUT, or winery signs. The simple, fourth-generation Zimmermann operation contains a century-old cellar, wine barrels and a candle-lit tasting room upstairs where you can sample four different wines. This morning, ride the shuttle (approximately 45 minutes) through the Eifel Valley to the city of Daun. 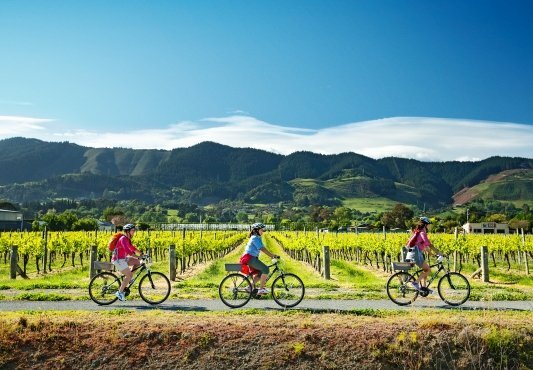 Climb on our bicycles there and take an exhilarating ride, climbing a slight incline at first and then coasting downhill along a former railway track that is now a cycling path. This exciting reel includes stretches through tunnels, over bridges and past small lakes formed from volcano craters, known as maars. By ride’s end, you will have passed castles, vineyards green forests and plenty of quiet villages. 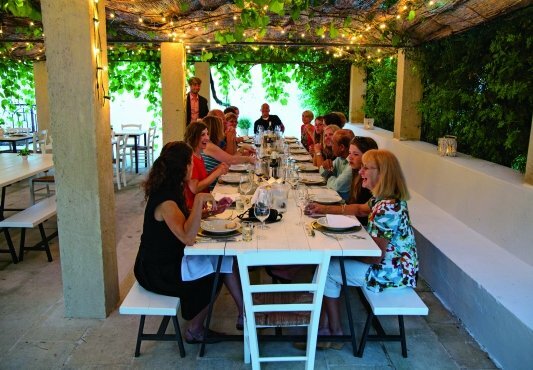 Along the way, stop in Gillenfeld and enjoy a simple lunch hosted by Sigrid and Leo Lenerz. Their café is idyllically located in an old barn and they specialize in regional products from local producers. Later, ride back to Bernkastel, where you can try one of the local restaurants for dinner on your own. Today, cruise out of Bernkastel and follow the Mosel downstream. After breakfast, arrive in Traben-Trarbach, an architectural jewel of Jugendstil surrounded by woodland and extensive vineyards. Traben-Trarbach was once the world’s second-largest wine-trading center. At the height of their prosperity at the turn of the 20th century, the city’s wine merchants built a number of fine Art Nouveau buildings, many of which are carefully preserved and continue to operate as wineries. There’ll be time to admire a wide range of Belle Époque splendor and you’ll quickly see why the city is a favorite destination for lovers of baroque and classical architecture. After, follow the river’s bike path to Zell. 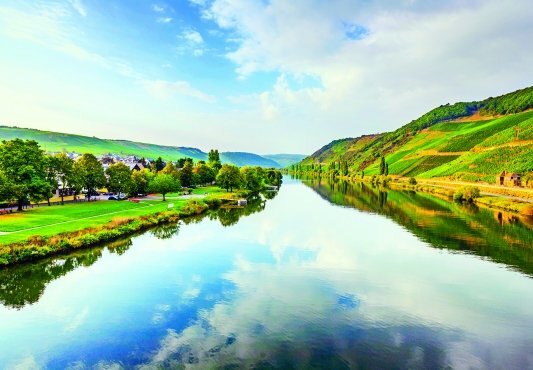 Beautifully situated on the Mosel, where the river meanders in many bends through the hills, Zell is one of the largest wine-producing communities on the waterway. One of the best wines made here, Zeller Schwarze Katze (Black Cat), is produced with grapes from 16 different locations. Be sure to notice the sculpture on the market-square fountain depicting a snarling cat on top of a wine barrel. Continue to Bullay, another big name in wine. You can linger here a while and pause to enjoy lunch along the route. You’ll find many picnic areas along the path. Rejoin the barge in Beilstein and cruise to Cochem later this afternoon, giving you ample time to relax and freshen up for a festive farewell dinner on board. VBT Air Package and Post-Trip Extension guests: After breakfast, say farewell to the crew and one VBT Trip Leader, then walk into Cochem with the other. This characteristic Mosel town is beloved for its steep vineyards, wooded hills, medieval buildings and a picturesque center with beautiful timber-framed houses. Hike or shuttle to Reichsburg Castle with a local guide, where you’ll enjoy a tour and spectacular views of the Mosel Valley and its vineyards. The fairy-tale castle includes seven rooms of fine furniture and objects from different periods and styles. After your visit, you may shop and eat lunch on your own before saying goodbye to your VBT Trip Leader. Then shuttle to Koblenz and settle in to your centrally located hotel. At 4:00 p.m., meet your local guide in the hotel lobby for a 1.5-hour walking tour around the historic Old Town. You will walk for 15 minutes to the starting point of the tour, so we recommend you leave the hotel with everything you’ll need to have dinner on your own in the Old Town at the tour’s end. After breakfast,* meet in the hotel lobby to transfer to the Frankfurt airport for your flight back home** Please be sure that you are waiting at the designated transfer time and location. VBT-Bicycle-Vacation-only guests: You are responsible for making your own way to Metz, France to meet your barge. Please arrive between 1:30 and 2:00 p.m. Please note that you cannot embark before this time as the barge is being prepared for you. If you are late, you must contact the barge as soon as possible to make alternate arrangements because we sail shortly after this time. The barge will be moored in the canal between the Pont du Canal and the locks of Metz, near the rue de Paris and the rue George Aimé. Contact telephone number is ++49 151 57 81 33 06 or ++31 620 245 095. VBT-Bicycle-Vacation-only guests: After breakfast, your tour ends. It is important that you leave the barge no later than 9:00 a.m. so our crew can prepare for their next guests. Upon arrival in Munich you will be met and transferred to the hotel. Our transfers are arranged by Taxi Guide München, telephone: +49 175 481 2848 outside Germany or 0175 481 2848 within Germany. If you do not see your driver please wait a few minutes by the “Erdinger Sportsbar,” which is directly in front of the exit into the arrivals hall after you’ve left the customs security area. If you arrive early, your hotel room may not be available until 2:00 p.m. You may store your luggage at the front desk. After settling in, enjoy the remainder of the day at leisure. Perhaps you’ll walk to the nearby Nymphenburg Palace and Gardens. 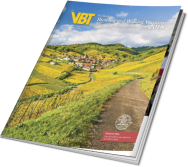 VBT provides you with City Information in your Final Travel Booklet that includes recommendations for what to see and do in Munich. At 3:00 p.m., a local guide will meet you at the hotel and take you on an orientation walking tour of the inner city. He or she will show you how to buy tram tickets for your ride into Munich’s center and the city’s main square, the Marienplatz. Then, enjoy an informative walk through the historic streets thronged with street musicians and artists and past magnificent buildings. You’ll no doubt want to return to visit many of them in more detail during the next two days. Your guide will point out restaurants where you can enjoy your first German dinner this evening. Spend today exploring Munich. At 11:00 a.m. and 12:00 p.m., the Marienplatz fills with onlookers as the carillon in the Rathaus tower clangs into action. Close by, visit the Peterskirche, the oldest church in Munich, notable for its grisly relics of St Munditia, patron saint of single women, and for the view from its tower (up several hundred steps but worth the climb on a clear day!). At the Munchener Stadtmuseum local history museum, browse a photo and film exhibit and a puppet display. North of the Marienplatz, stroll to the posh end of the city center. And from the fashionable Maximilianstrasse, the little Kosttor road leads straight to the Hofbrauhaus, Munich’s largest and most famous drinking hall. You can also enjoy the tranquility of the English Garden, Munich’s largest natural park. Located north of the city, its bucolic setting and vistas draw thousands of visitors for walks and picnics. If you’d like, you can join the locals and swim in the rivers that run through it. The park houses several popular beer gardens that provide a lovely rest stop after a day of exploring. Today you may visit the interesting BMW Automotive Museum, which displays the history of the company in relation to the development of the modern automobile. Car buffs will enjoy the museum’s exhibits, videos, slide collections and films. Nearby, visit the neighboring Olympic Park, site of the 1972 Olympic Games. Walk through the lovely park, visit the modern and mesmerizing stadium, and take in great views from the Olympic Tower. Or you may wish to venture out of Munich. The Dachau Concentration Camp and memorial is on the northern edge of Munich and was the site of Germany’s first concentration camp. Today, it is a place of memory and pilgrimage and makes for an educational and sobering day trip. For a longer excursion, join a full-day coach trip to Berchtesgaden, Hitler’s mountain retreat and the southern headquarters of the Nazi party. The dictator’s Eagle’s Nest lodge was built here by the Nazis. At 6,148 feet atop Mt. Kehlstein, it has some of Germany’s most amazing views of the Alps – despite its history. Or visit the enchanting old-world town of Fussen, set in the foothills of the Alps and surrounded by one of the most breathtaking natural vistas in the world. You’ll see “Mad Ludwig’s” storybook Neuschwanstein Castle, the nearby lake, and a postcard-perfect aerial view of the equally beautiful Hohenschwangau Castle and the waterfall gorge. You can reserve all these tours through your hotel in Munich. This morning, transfer from your Munich hotel to the airport for your flight to Luxembourg City. Upon arrival in Luxembourg City, you will be transferred to the Hotel Le Royal and have time to explore and have lunch on your own. VBT provides you with City Information that includes recommendations for what to see and do in Luxembourg City. Your hotel room may not be available until 3:00 p.m., but you may store your luggage at the front desk. The rest of the day is free for you to discover this fascinating city, the capital of one of Europe’s smallest countries. Explore cobblestone-arched narrow streets and small elegant palaces such as the Palais Grand-Ducal and the Chambre des Deputes. The beautiful Chemin de la Corniche is said to be Europe’s most beautiful terrace, with a pleasant promenade that passes restored ancient homes. You’ll also bask in the beauty of the city’s two major squares: the regal Place de la Constitution and the cozy Place du Marche, still used for weekly flower and vegetable markets. This morning, transfer to Frankfurt’s railway station and take the Intercity Express (ICE, the German high-speed train), to Berlin (approximately 4 hours 15 minutes). We recommend that you buy a picnic lunch to eat on the way. When you reach Berlin Ostbahnhof (German for Berlin East railway station), a VBT representative meets you and helps you transfer (approximately 1 hour 20 minutes) to your centrally located hotel. Our transfer company is European Limousine, telephone: +49 351 49 03 640 or +49 163 340 88 11 outside Germany or 0351 49 03 640 or 0163 340 88 11 within the country. VBT provides you with City Information that includes recommendations on what to see and do in Berlin. The rest of the day is yours to explore the city independently. Meals are on your own. Later in the day, VBT’s local representative is available at the hotel to answer your questions and recommend more activities for the rest of your stay. Your Trip Leaders will have already provided you with a “Transfer Reminder.” Keep this handy so you’ll know when your airport taxi will pick you up on the last day of your extension. Discover this amazing capital of culture and art. An optional walking tour will be available. This 2.5-hour program may be booked with your VBT representative upon arrival in Berlin (it may not be booked in advance of travel). The approximate price is €30 per person (with a minimum of 2 people required) and includes the services of our local English-speaking guide. The tour takes you through Berlin’s historic heart. Walk toward the famous Museum Island (a UNESCO World Heritage Site), see the Reichstag Parliament House, and pass through the Holocaust Memorial Area. Past the New Potsdam Square, stop at the Topography of Terror to see an original piece of the Berlin Wall. Your tour ends at the legendary Checkpoint Charlie. You may wish to continue on your own to the nearby Jewish Museum. Or return to the hotel, where you might take a riverboat tour on the river Spree, which departs twice daily from a dock near the hotel.